SwatchCart - The combination of Bootstrap 3 and OpenCart 1.5+ allows you to build your own eCommerce site that's compatible on all devices with ease. The combination of Bootstrap 3 and OpenCart 1.5+ allows you to build your own eCommerce site that's compatible on all devices with ease. Bootstrap Opencart is an OpenCart theme designed entirely using Bootstrap 3.0.3 with minimal customizations. It's fully responsive and works on all devices. It's compatible with any of the themes from http://bootswatch.com/ making it easy for you to change the theme. You can also easily add and remove components using OpenCart. Simply upload the theme folder 'bootstrap_shopping_cart' to the opencart/catalog/view/theme/ folder and activate the theme. Falls back onto existing OpenCart styles for custom extensions. Note: No product images are included with the theme. They are included with OpenCart's own sample content. Don't forget! Because you're using a theme built with Twitter Bootstrap, you get access to everything in the Bootstrap component library and ecosystem. 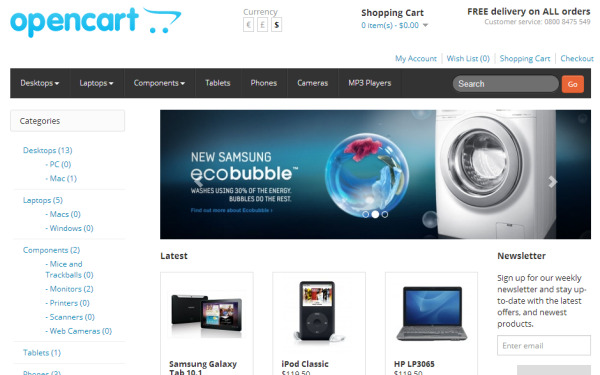 The use of OpenCart makes it very easy to get started with your own web store in very little time. The combination makes Bootstrap OpenCart an excellent choice for your next project. It's simple to customize and change themes.